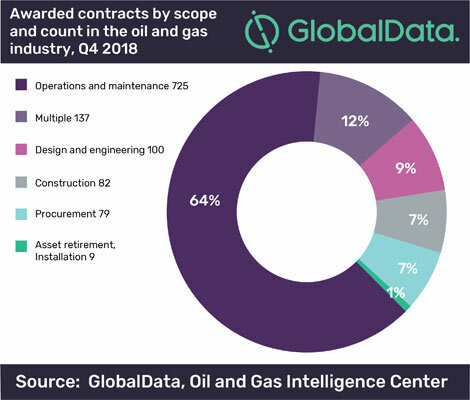 In 4Q18, the oil and gas industry reported 1180 contracts, of which 1132 were awarded contracts, according to GlobalData. The company’s latest report: ‘Quarterly Oil & Gas Industry Contracts Review’ states that the upstream sector reported 75% of the total awarded contracts, with 852 contracts. The midstream sector recorded 164 contracts, representing 14% of the total awarded contracts, followed by 98 contracts in the downstream sector; representing 9% of the awarded contracts during the quarter. EMEA recorded the most contracts with 487 contracts, representing around 43% of the total awarded contracts in 4Q18. Americas region closely followed with 449 contracts, accounting for 40% of the total awarded contracts. Operations and maintenance represented 64% of the awarded contracts in 4Q18, followed by contracts with multiple scopes, such as construction, design and engineering, installation, O&M, and procurement, which accounted for 12%. One of the high value contracts was Petrofac, Saipem, and Samsung Engineering consortium’s US$4 billion contract from Thai Oil for the Engineering, Procurement, Construction and Commissioning (EPCC) services for Clean Fuels Project at Sriracha refinery in Chonburi, on the East coast of Thailand. Other notable contracts during 4Q18 included Saipem and Renaissance Heavy Industries joint venture’s contract worth €2.2 billion (US$2.5 billion) for the construction of three LNG plants, as well as LNG storage facilities for Arctic LNG 2 project in the Gydan Peninsula, Russia; and BHGE, McDermott International, and LTHE consortium’s subsea contract was worth approximately US$1694.45 million for the Engineering, Procurement, Construction, Installation and Commissioning (EPCIC) of Subsea Production Systems (SPS) including 34 deepwater trees, and Subsea Umbilicals, Risers and Flowlines (SURF) for 34 wells for the development of block DWN-98/2 in the Krishna Godavari basin, off the East Coast of India.